New York. You love it or you hate it. Recently, New York and I have been a bit at odds. All this traveling and being away from here has made my return full of rejuvenated vigor but it also reminds me that the world is big and that NYC is not all there is. We tend to forget this, we New Yorkers. We forget we are not the center of the universe. We are, but we aren’t. I am not the only one who feels estranged by this city from time to time (gawd if only I could afford a country home). There have been slews and slews of great, good and just below average writers that have essayed, blogged and merely complained about this place, this city. I am not at the breaking point they describe, far from it, but I have to say, all this busy-business here makes me suspicious. Possibly (probably) this business is just one living life but perhaps it is also a symptom of something else. I love New York, I think New York loves me still and until we get sick of the sounds of each other's voices, the way we flick our hair, the way we laugh, the way we can see the magic in each other then I fear(love) that I am here until death do us part. 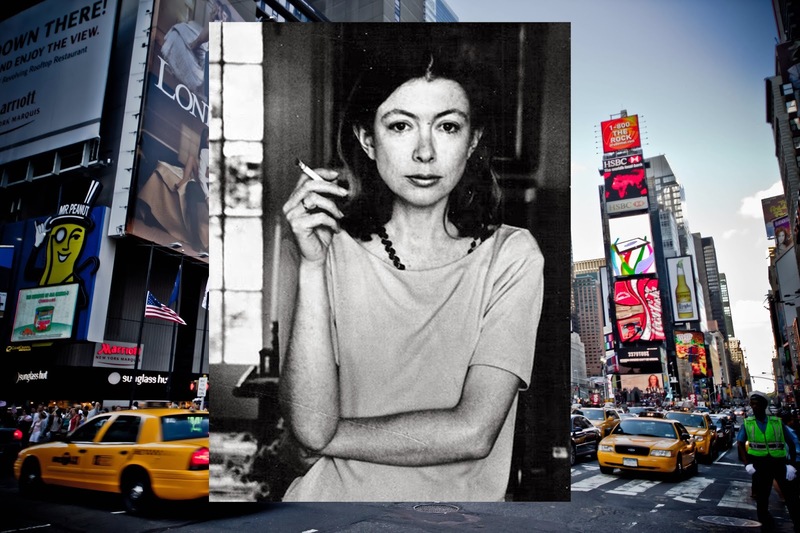 Below is a fantastic essay by the one and only Joan Didion on New York and her leaving it. It’s pretty famous so most of you have probably read it but if not you are in for a reading treat. It is from 1967, seems far but really that’s just a speck of time. There are things remarked on and way of saying things that just hits things so squarely on the head. For those who have been here for nearly ten years or more (like moi), it will strike you like a chord. It would be a long while because, quite simply, I was in love with New York. I do not mean “love” in any colloquial way, I mean that I was in love with the city, the way you love the first person who ever touches you and you never love anyone quite that way again. I remember walking across Sixty-second Street one twilight that first spring, or the second spring, they were all alike for a while. I was late to meet someone but I stopped at Lexington Avenue and bought a peach and stood on the corner eating it and knew that I had come out of the West and reached the mirage. I could taste the peach and feel the soft air blowing from a subway grating on my legs and I could smell lilac and garbage and expensive perfume and I knew that it would cost something sooner or later—because I did not belong there, did not come from there—but when you are twenty-two or twenty-three, you figure that later you will have a high emotional balance, and be able to pay whatever it costs. I still believed in possibilities then, still had the sense, so peculiar to New York, that something extraordinary would happen any minute, any day, any month. I was making only $65 or $70 then a week then (“Put yourself in Hattie Carnegie’s hands,” I was advised without the slightest trace of irony by an editor of the magazine for which I worked), so little money that some weeks I had to charge food at Bloomingdale’s gourmet shop in order to eat, a fact which went unmentioned in the letters I wrote to California. I never told my father that I needed money because then he would have sent it, and I would never know if I could do it by myself. At that time making a living seemed a game to me, with arbitrary but quite inflexible rules. And except on a certain kind of winter evening—six-thirty in the Seventies, say, already dark and bitter with a wind off the river, when I would be walking very fast toward a bus and would look in the bright windows of brownstones and see cooks working in clean kitchens and imagine women lighting candles on the floor above and beautiful children being bathed on the floor above that—except on nights like those, I never felt poor; I had the feeling that if I needed money I could always get it. I could write a syndicated column for teenagers under the name “Debbi Lynn” or I could smuggle gold into India or I could become a $100 call girl, and none of would matter. You see I was in a curious position in New York: it never occurred to me that I was living a real life there. In my imagination I was always there for just another few months, just until Christmas or Easter or the first warm day in May. For that reason I was most comfortable with the company of Southerners. They seemed to be in New York as I was, on some indefinitely extended leave from wherever they belonged, disciplined to consider the future, temporary exiles who always knew when the flights left for New Orleans or Memphis or Richmond or, in my case, California. Someone who lives with a plane schedule in the drawer lives on a slightly different calendar. Christmas, for example, was a difficult season. Other people could take it in stride, going to Stowe or going abroad or going for the day to their mothers’ places in Connecticut; those of us who believed that we lived somewhere else would spend it making and canceling airline reservations, waiting for weather bound flights as if for the last plane out of Lisbon in 1940, and finally comforting one another, those of us who were left, with oranges and mementos and smoked-oyster stuffings of childhood, gathering close, colonials in a far country. Dealer Fever – David Zwirner etc.